Before we set-off there were already ten species on our bird list for the day, including Kama – Hawker to and fro journeys by several Rainbow lorikeets. There’s no doubting their appeal with plumage representing the rainbow but they are not, technically, birds of our region. It’s thought that the Hawker group has built up numbers from released aviary birds. They’re known in Aranda regularly also. At this time of the year some of them disperse into other suburbs. There were three checking out Flynn earlier this week. In some adopted places their numbers are causing concern. Even though they’re a native species they are assertive and compete for increasingly scarce nest hollows. The weeds trackside show that the passage of feet and vehicles causes weed-seeds to spread. We could see and explain the results of fotpin’s African Lovegrass spraying. Stephen and Caroline asked “Wouldn’t the native species win out against invading weeds eventually?” A fair question (see footnote 1). Fotpin is taking no chances with ALG which could readily spread from mowing around Dungowan street deeper into the reserve. As we wound up the track between the Marrakai street houses and the Stringybark forest we looked at the contrasting vegetation. In summer the land abutting the houses’ gardens was slashed reducing all vegetation to ankle-height. In this particular area most of the plants are natives and examples of Pinnacle species. Perhaps the shrubs will take the cutting as a stimulus to new growth ready for spring. Two negative signs hereabouts were the many rabbit-scrapings and their dung. And human pests had moved or turned over quite a few rocks exposing the miniature but essential colonies and habitats below. Perhaps they were looking for reptiles. Scorpions are in this area under rocks but I wish the turners would replace the rocks they disturb. We found several Urn heath (Melichrus urceolatus) in flower. 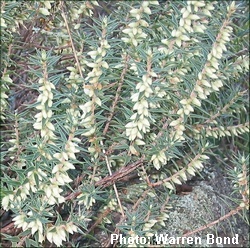 Their creamy-yellow, heather-like bells will be visible all through winter. I wonder what pollinates them? A lone bright yellow Goodenia was in flower on the edge of the rough track’s bank. We’ll have to wait some months before the Hardenbergia even begin to show their purple buds. At ANU Kate is in the process of writing-up her PhD thesis relating to studies of Common mynas. She installed 15 nestboxes in about 15 reserves and areas of urban open space to establish whether native birds would use the boxes and perhaps be evicted by the aggressive introduced mynas. Canberra has a fine record of myna eradication due to the backyard action of over a thousand community members enticing the birds into small traps. Beside the track we found some spectacular, scarlet-orange bracket fungi on pieces of timber. I turned one piece over and found where the fungi wrapped around the very dry wood. There was a small Red-backed spider curled up under some spider-silk, a weird-looking brown larva and three lines of tiny black eggs laid in precise rows. Oh for the technology where I could send in a photo & have the larva, eggs and fungus identified instantly! 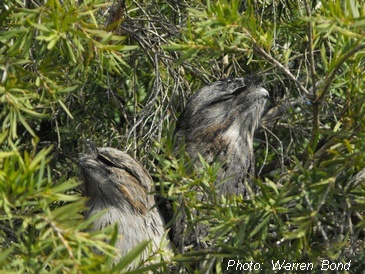 Three walkers on the point of moving off the track and into the suburb tipped us off about there being “three Tawny frogmouths in the tree beyond the stile”. We varied our route and Wendy found the first bird. It was looking much plumper than the field guide illustration and the other two were snuggled close together against the tree’s trunk. The family was well worth the detour and was the catalyst for observations about camouflage, the female’s night-time incubating and the male’s task during the daylight hours. Apparently-young eucalypts 1-2 metres tall are now showing again as the tall grasses die down for winter. Some of these are quite old plants but they’ve found it tough growing where fate landed the seed. We found instances of several young trees perhaps 10m from a mature tree. 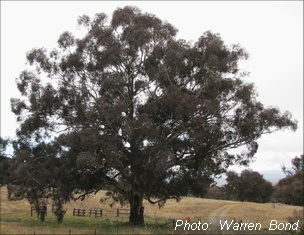 Sometimes there are no seedlings or saplings close to the large trees, a feature of the bush which shows some species’ ability to inhibit the growth of their seeds to prevent their competing with the parent plant. Alleopathy is a fascinating branch of science. It’s likely that many more species can severely influence their offspring in this way or utilise chemicals against other potentially competing plants. Clusters of Acacia growing close together suggest the area was burnt 10 to 15 years ago. Acacia seeds require heat in order to crack open for germination. Dense Acacia thickets can become a monoculture, having an excluding effect on other species by sheer numbers. As they age they can become “scruffy’ but still be beneficial habitat for small birds seeking insects on the foliage or under peeling bark. And some host symbiotic relations between insect larvae and ants. Stephen raised another query - “bush tucker”. Some surviving Briar roses may have prompted this line of thought although those we came across were too young to have hips; a weed as a known source of good quantities of Vitamin C. Cherry Ballart trees have small cherry-like fruits in early autumn and our detour meant we missed another food plant the Hairy Appleberry this time. We’d need to compare our Pinnacle Reserve plant list with food-plant lists for the local area. Several trees were examined as ‘pine-like’ including the semi-parasitic Cherry Ballart. Callitris pines are Pinnacle species as are Allocasuarina and Casuarina. They all have seemingly needle-like “leaves” which consist of whorls of tiny green scales. Their dense habit creates a visual contrast to the more open and familiar gums and wattles. In some areas there were scattered specimens of Lesser broomrape. This introduced parasitic plant looks hyacinth-like even when browned-off for winter. They seek to parasitise the roots of a range of forest, pasture and, at home, garden plants. John and Lesley went off to resume their weeding-program. As sunny periods became more lengthy we found more native Bluebells (Wahlenbergia spp.) turning their flowers towards the sun and warmth. At this time of the year even the common Wahlenbergia flowers seem very deep blue-purple, similar in colour to the high-country Wahlenbergia gloriosa which is the territory’s floral emblem. In the course of the walk we encountered three types of yellow daisies as grassland or understorey plants. Common everlasting and Clustered everlasting have their small almost-pom-pom shaped flowers clustered together. The stiff papery bracts of the Sticky everlasting are more recognisable as one of the paper-daisies which successfully transfer from garden to a long-lasting flower arrangement. All three species are present east of the forest where we had a brief look at other grassland species in the open area. Here we had wide views over the Kama property which generated discussion on land management and whether the view was threatened by development aspirations. In the forest we followed kangaroo tracks and had previously mentioned their droppings and dung beetles’ ecosystem-services. We’d seen a few relaxed kangaroos in the middle distance. How had the fallen Apple box, Eucalyptus bridgesiana survived with the shallow roots its toppling revealed? We could see how its bulk was sheltering lush plant growth. This is an area we’re targeting Fleabane as a weed in the otherwise relatively clean forest. Small green rosettes of a Greenhood orchid species were the reason for this route. There are many more than in April last year though they may be waiting for rain before continuing through to flowering. Caroline noticed several plants with red leaves and set up another query. Some plants’ leaves turn red when stressed or perhaps this is a sign of reaction to winter cold. Thanks to Caroline and Stephen for “ giving us a try” after reading a notice about the walk on the cavaletti. And Wendy, Lesley and John loyal explorers, observers and contributors-to-debate. We look forward to the next walk on 18th June! 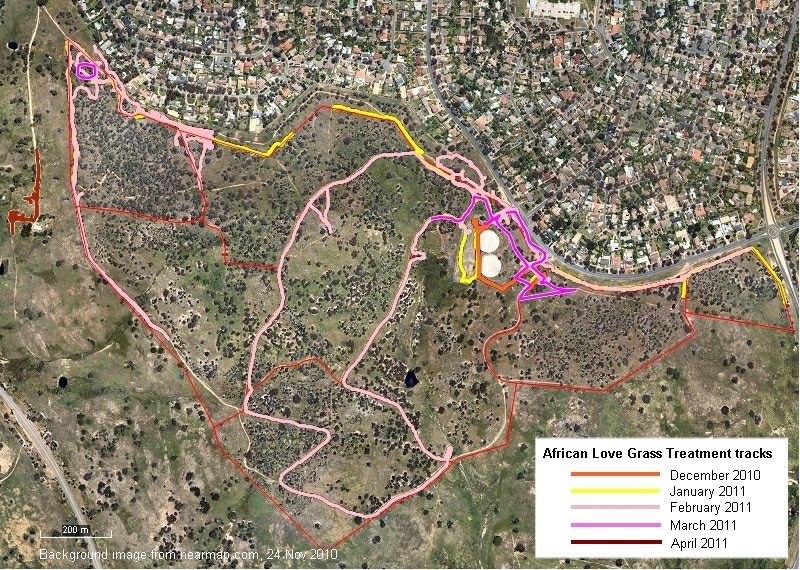 1. webmaster's note: fotpin's native grass regeneration project is looking at this problem. Evidence suggests that the changed nutrient regime of the land brought about by farming gives exotic species a competitive advantage over the native grasses. The project is exploring ways of reducing the nutrients and giving the native grasses the upper hand again. Anecdotal evidence suggests that slashing the exotic grasses also gives the native grasses, which tend to have longer growing seasons than many exotic ones, a helping hand. 2. webmaster's note: Although not linked in to the menu system yet, our new "Birds of The Pinnacle Nature Reserve" page is now ready for viewing. Here you can find links to local photos, bird call recordings and information about the bird species mentioned in this blog.